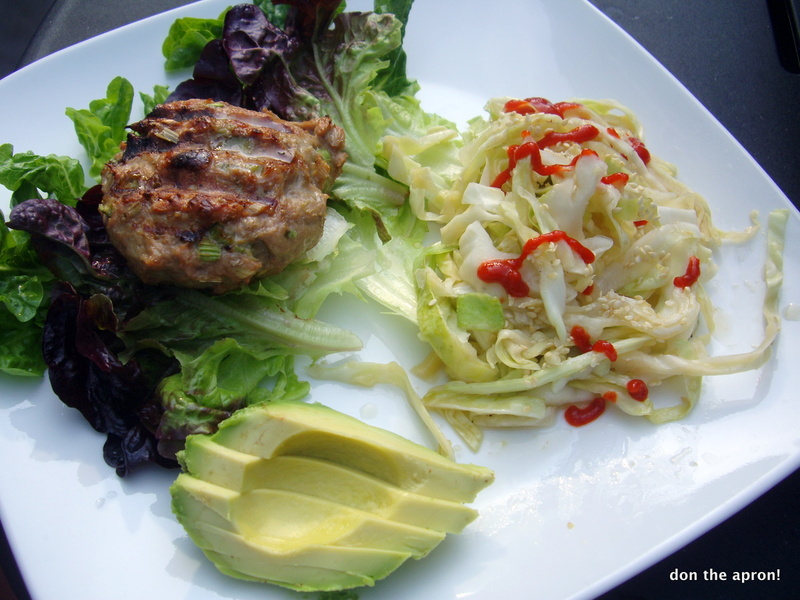 Lemongrass Turkey Burgers + Asian Slaw | Don the Apron! When my mother first came to visit me in North Carolina, it was the middle of the humid, heavy Southern summer. “Wow,” she said, “I think it’s hotter than Malaysia here.” Here’s a burger recipe I thought up when missing the flavors of home in my new home. I laughed when Jessica Seinfeld’s [yes, Mrs. Jerry] book came out a few years back. The shtick of the book was to get your children to eat more vegetables by hiding them in your regular dishes. This is something my mom has been doing for years — not just to increase the nutritional content, but also to frugally stretch the meal, add flavor, and provide a textural contrast. To this day I prefer my meatballs with tiny diced pieces of carrot. 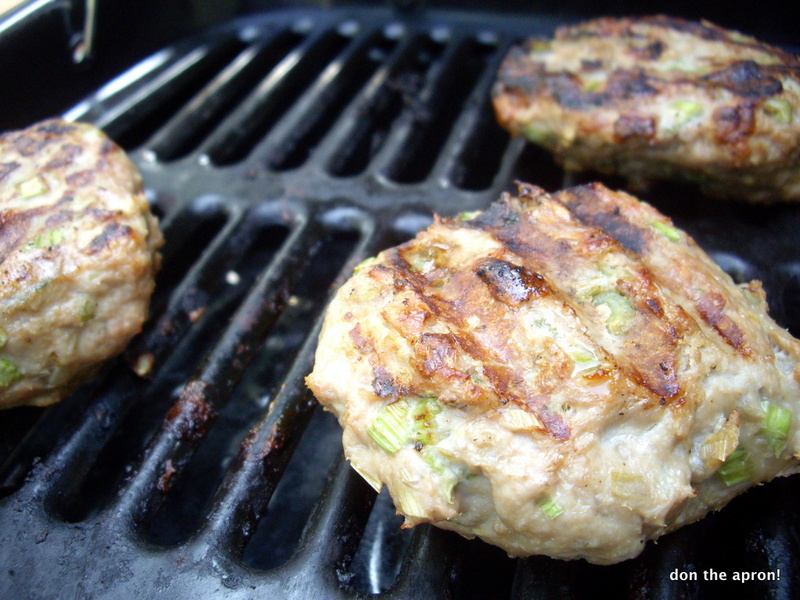 These burgers are stuffed with chunks of celery, which add a nice visual pop as well as a bit of a crunch. Delicious. 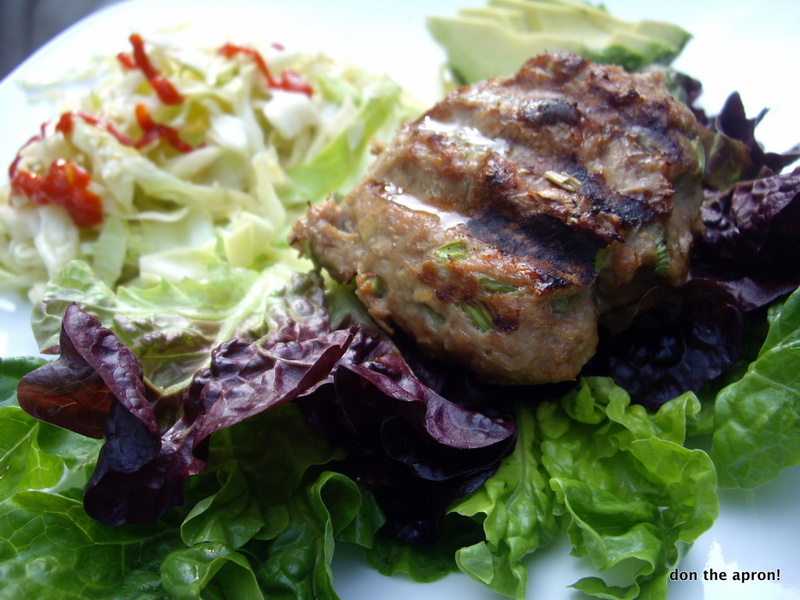 Typical Southeast Asian ingredients, repurposed, make these burgers unique. If you go to the Asian grocery but don’t want to use your lemongrass right away, have no fear. Wrap it well in plastic and freeze — it will last a few months — and pop it out whenever you have a craving for something a little different. I served my burgers breadless, on a bed/bun of oakleaf lettuce. This pairs well with a simple Asian-inspired cabbage slaw, as well as Sriracha hot sauce and half an avocado as a creamy side. Bonus points for a cold, light beer and a hot day. In a mortar and pestle or a mini food processor, process first seven ingredients together to form a paste. Combine paste with remaining ingredients, cover and refrigerate for 30+ minutes to allow flavors to meld (I made the burgers a day in advance and they were fine). Grill over a flame or in a pan until slightly browned and juices run clear. Serve. Combine all ingredients but sesame seeds, allow to rest 30 minutes in the refrigerator so flavors can meld. Just before serving, garnish with sesame seeds. This entry was posted in Chicken, Main, Malaysia, Recipe by Lin. Bookmark the permalink. Stunning photos, Lin, and of course it sounds delicious!